Click the button top right labelled ‘Month’ to change how the calendar is presented. There are two possible views, with ‘Month’ being the default and ‘Agenda’ (aka list) being the alternative. In the month view, the events for the current month are shown. In the agenda view, the events from the current day onwards are shown in 10-day blocks. In the month view, click any of the events to view the full details about the event. In the agenda view, click any of the events to view a description of the event. Then, if you want, click the ‘read more’ button to view the full details about the event. 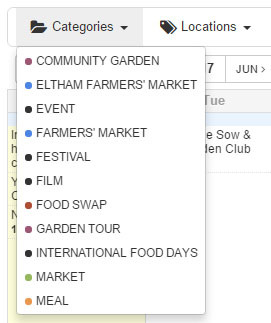 One useful feature is the ‘expand all’ button top right which shows the descriptions for all the events on the page. In the month view, click the preceding/following months top left or bottom left to move backward/forward one month (or the preceding/following years to move backward/forward one year). In the year view, click the back/forward arrows top left or bottom left to move backward/forward through the calendar in 10-day blocks. Type of event (e.g. markets, food swaps, etc). 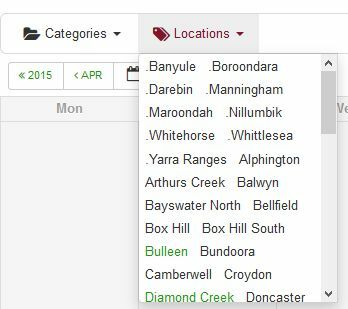 To search by suburb or local authority, hover your mouse over the word ‘Locations’ top left and then select (i.e. 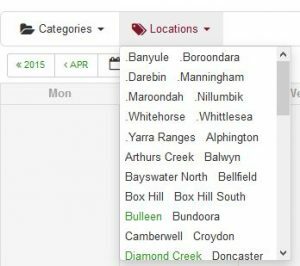 click) one or more suburbs or local authorities from the list of that pops up. You can keep adding more suburbs or local authorities to the filter if you want. Ditto removing suburbs or local authorities. Note that, to put them at the top of the alphabetical order, the local authority names each have a ‘.’ in front of them. When filtering by suburb or local authority, you may want to look at the results as a list rather than the monthly calendar – to do so, click the button ‘Month’ top right and then select ‘Agenda’. If you then save the resulting url as a favourite/bookmark then this link will always show these suburbs or local authorities. Pressing the cross next to the word ‘Locations’ clears the filter. In similar ways, the calendar can be filtered by type of event (e.g. markets, food swaps, etc) by hovering over the word ‘Categories’ top left. Finally, although it cannot be done from the calendar page itself, the calendar can effectively be searched by event name or keyword using the Google-like search box top right on either this help page or the home page. You can add the calendar to your Gmail, Outlook or Apple calendar using the button bottom right labelled ‘Subscribe’. It will henceforth keep your copy of the calendar in sync with the website version. 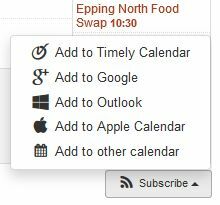 Or, if you are looking at a particular event, you can add that event to your Gmail, Outlook or Apple calendar using the button top right labelled ‘Add to Calendar’.